We comb through hundreds of box scores, game recaps and releases each week to find our Notebooks nuggets. If there’s something noteworthy you think we need to add drop us an email. 7…Wins apiece for South Alabama pitcher D.D. Hanks and Asher Wojciechowski of The Citadel. Both earned their nation-leading wins Friday night. 8:13 P.M…The time (Eastern) South Alabama’s 9-2 win over New Orleans ended Friday night, making Hanks (7-1) the nation’s first 7-game winner. He struck out 9 in his fourth complete game effort of the season. 9:37 P.M…The time (Eastern) The Citadel’s 3-2 win over Wofford ended Friday night, to make Wojciechowski the nation’s second 7-game winner. He fanned 9 as well in 8 innings of work. 46…Combined wins by Arizona State and UCLA to open the 2010 season. 2…Combined losses by ASU and UCLA Friday night, as they both tasted defeat for the first time to Pac 10 foes. ASU’s 24-game winning streak and UCLA’s 22-game streak were both respective school records. Both the Sun Devils and Bruins would win their series finales to win 2 of 3 games on the weekend. 5:24…Time of ASU’s 6-5 loss in 12-innings to Oregon Friday night in Eugene. The game featured an hour and five minutes of rain and lightening delays. game-ending RBI single in the bottom of the 12th inning. 1…Career home run by ASU’s Drew Maggi-a solo shot that gave the Sun Devils a 1-0 win over the Ducks in the series-opener to run their record to 24-0. 7…Runs scored by Stanford in the 5th inning en-route to their 8-4 win over UCLA that same night. 6…Of those runs that were unearned due to a throwing error that started the frame. Four runs crossed the plate with two outs. 9…Innings pitched by Stanford’s Jordan Pries (3-1) who notched the second complete game of the season for both he and his team while handing the Bruins their first loss. 3…Home runs hit by Virginia Tech in Saturday’s 8-7 win at Florida State. Coupled with Friday’s 10-5 series-opening win over the Seminoles, the Hokies notched their first series win ever over FSU (the lost 9-6 in Sunday’s series finale). 400…Career wins for Virginia Tech head coach Pete Hughes after the weekend’s two wins over the ‘Noles. Hughes is in his 14th year as a head coach. 2…Wins by Georgetown in its three-game series with Notre Dame to give the Hoyas their first ever series win over the Fighting Irish. 1…Grand slam hit by North Carolina State’s Andrew Ciencin to help the Wolfpack upset #3 Virginia Sunday. The win gave NC State its second win over the Cavs in the 3-game series. 9 of 9…Virginia closer Kevin Arico’s record in save opportunities this season prior to his first blown save in Friday’s 6-5 loss in 11 innings to NC State. 500…Wins at NC State by head coach Elliott Avent after the Friday night win. He’s just the second coach in school history with as many victories. 16…Strikeouts in 9 innings by South Florida’s Andrew Barbosa in Friday’s 5-0 win over Cincinnati. 9…Combined strikeouts in 3 2/3 innings by Cincinnati relievers Brian Garman and Andrew Burkett in Saturday’s 4-3 win over the Bulls. Garman (3-0) fanned 7 of the 9 batters he faced to earn the win, while Burkett K’d 2 of 3 Bulls in the 9th to notch his 5th save. 3…Grand slams hit in a span of five games by East Carolina’s Zach Wright, who connected on his third slam in Tuesday’s 8-0 win over Elon. 15…Strikeouts by ECU pitcher Zach Woods-a career-high-in that same win over Elon. He fanned 7 of the first 9 batters he faced to become just the second Pirate pitcher in the last 40 years record 15 punch outs in a game. 20 & 23…Runs scored Thursday and Friday by Cal State Fullerton in wins over UC Davis to give the Titans back-to-back 20-run games for the first time in 30 years. They won Saturday’s finale 3-2 to open 3-0 in Big West play. 21 2/3…Innings pitched by Texas hurlers prior to surrendering a run to Oklahoma en-route to a 3-game weekend sweep. The Longhorns won by finals of 5-0, 2-0 and 9-3 in Norman. 11…Game winning streak by #35 Pittsburgh-a school record-heading into last weekend’s Big East series at Rutgers. 5…Runs scored by Rutgers in the bottom of the 9th inning of Thursday’s 9-8 series-opening win to snap Pitt’s streak. The Scarlet Knights won game two 6-1 to run their winning streak to eight before falling 6-5 to the Panthers in the finale. Since a 1-8 start to the season RU has won 13 of its last 16 games. 3…Straight complete games pitched by UT Arlington right-hander Jason Mitchell (4-2) after Thursday’s 4-0 win over Nicholls State. 3…Games played away from home this season by Arizona, which opened the season with a 20-5 record at Kindall Field/Sancet Stadium. 3…Losses by Arizona at Cal in their first road trip of the year. The Golden Bears beat the Wildcats by finals of 7-2, 8-0 & 4-3 in Berkley over the weekend in the second Pac 10 series of the season for both teams. 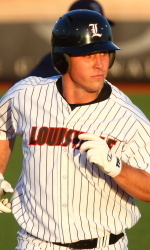 13…Total bases for Louisville’s Andrew Clark in Thursday’s 12-4 win over Villanova. The senior first baseman was 5-for-5 with two home runs, two doubles and 5 RBIs in the game. 13…RBIs for Clark in his last seven games since returning from a rib cage stress fracture. Clark’s 9th inning game-winning HR in Tuesday’s 5-4 win over Indiana is among the four home runs he’s hit in that stretch. 28 2/3…Scoreless innings streak by Indiana pitcher Drew Leininger that ended with Clark’s home run. 26…Runs scored by IU in Sunday’s 26-6 win over Michigan-the most runs ever scored by a Hoosier team in Big Ten play. The final scored was also the most lopsided win for IU in the 186 game series vs. the Wolverines, who still won the series 2-1. 1…Hit allowed by Rice’s Taylor Wall in Thursday’s 6-0 win over cross-town rival Houston. Wall struck out seven with one BB to earn the Rice pitching staff’s first complete game of the season. 6…Sacrifice bunts by TCU-a school record-in Thursday’s 4-1 win over visiting San Diego State. 2-1…Score of Pacific’s Big West series-opening win at Long Beach State. 1998…The last time Pacific won a road game at LBSU (the Dirt Bags still won the series 2-1). 12…Strikeouts in 8 innings by UC Irvine pitcher Daniel Bibona in a series-opening 16-2 win over Cal State Northridge en-route to a 3-game sweep to open Big West Conference play. 6…Runs scored with two outs in the 8th and 9th innings of Tennessee’s 10-6 win over Ole Miss on Sunday to win the series 2-1. 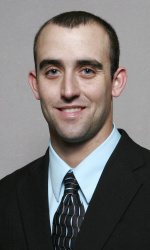 2…Home runs by Tennessee outfielder P.J. 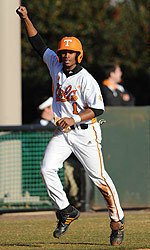 Polk in Saturday’s 5-2 win over Mississippi. 10…Doubles hit by North Florida-a school record-in a 13-5 win over East Tennessee State. 4…Of those doubles that were hit by UNF catcher David Eldredge. 20…Game hitting streak by Central Florida’s Chris Duffy after recording at least one hit in all five UCF games last week. Duffy is among the nation’s leaders with a .478 average, 13 HR and 48 RBIs. 12…Strikeouts in 5 2/3 innings in two appearances by Wichita State reliever Cobey Guy. The senior logged a career-high 3 1/3 innings with 6 Ks after entering the game in the first inning of Sunday’s 17-2 win over Evansville. 1,700…Career wins by Wichita State head coach Gene Stephenson after Sunday’s victory over the Purple Aces, making him just the second coach in Division 1 baseball history to reach that milestone.